What would you make with Amanda Murphy's Free Motion Fantasy fabrics? We have five designers this week who will be showing you how they used these fun, colorful prints. 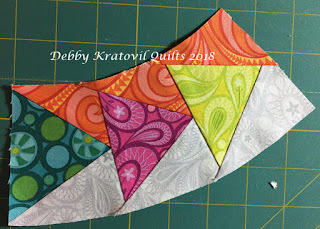 Up first is Debby Kratovil from Debby Kratovil Quilts with a Technique Tuesday post. Today's technique: paper piecing! Debby says, "I love bright colors and these new fabrics by Amanda Murphy, Free Motion Fantasy, are right up my alley!" For her Technique Tuesday post, she's showing how to use these prints to make a scrappy version of her Circle of Geese pattern. Head over to Debby's blog to see how she creates her quilt (we love how those geese are looking here!) and enter for a chance to win a fat quarter bundle of Free Motion Fantasy for yourself. Click here to see the entire Free Motion Fantasy collection. Click here to visit Amanda's website. I love these beautiful, bright fabrics! So many of the fabrics could be used for free motion quilting. Beautiful colors. You have the best ideas and patterns! Friday Free Patterns that Glow!